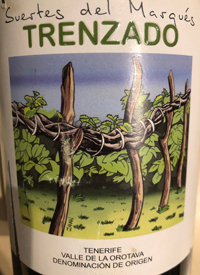 Tenerife, Canary Islands, SpainFrom the volcanic soils of Tenerife, this is a village blend led by Listán Blanco, with 10-150 year old native varieties like marmajuelo, guao, vijariego blanco, verdelo, torrontés and baboso blanco sourced across various vineyards 300-700m in the Valle de La Orotava and predominantly grown in the traditional cordón trenzado training system. After native ferment in concrete, and older French casks, this aged nine months on lees in concrete, foudres and older 500L barrels. Salty, salty, salty, with apricot blossoms, pear skin, kernel, and highly alluring dried wild herbs along an oil-slicked palate. Marine kisses throughout and a bright acidity keep this wine thirst-quenching and smashable.Tasted: 22 January 2019Tasted by: Treve RingPrices: ON	27.95	consignment Producer: Suertes del MarquésDistributors: Le Sommelier Inc.